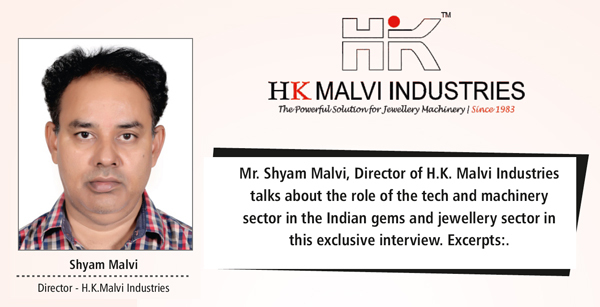 India is already a global jewellery manufacturing hub, Indian jewellery makers & artists across India have played a huge role in the growth of the tech and machiery sector. We believe this combination of technology & artisan is the ultimate for the evolution. India has now become the largest exporter of jewellery machines over the past 5 years in comparison with italian & turkish machinery manufacturers this I do feel is a healthy sign and will only grow with time. After sales support is always the most important factor when it comes to selling any product or service in India. As I said earlier Indian manufacturers of tech tools are always at an advantageous position when it comes to serviceing the customers. We should always try to be innovative and come out with proucts that are tailor made and user friendly. This I believe will not only generate more business but will also help the jewellery manufacturing sector grow and be more competitive in the global market.